Suddenly in Command! What would you do if you found yourself suddenly in command when the skipper is incapacitated? This is the ideal course for those who enjoy boating but are not often at the helm. 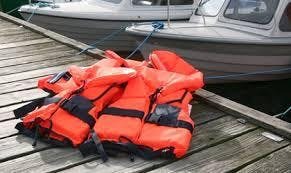 Boating problems and emergencies can occur, and you may find yourself suddenly in command. How can you get help? How can you get to shore? What can you do if boating mishaps arise? This course covers some essential boating information about what to do in these situations. Topics include pre-underway planning, developing situational awareness, understanding how boats handle, VHF radio introduction including how to get help in an emergency, Coast Guard required safety equipment and regulations, and accident assessment and reporting. This course is taught by members of the U.S. Coast Guard Auxiliary. This class meets Monday, April 22, 2019 and Wednesday, April 24, 2019 from 6 - 8pm. All required materials are included in the course fee. Navigating Mid-Coast Maine Cruising the coastal waters of Maine can be fun, especially when you know how to read a nautical chart so you miss all those rocks and arrive safely at your destination. 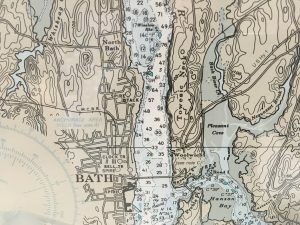 This course is taught by members of the US Coast Guard Auxiliary and serves as an introduction to navigation using The Three Rivers Chart (#13293). This way you'll become familiar with the coastal waters of our local region between Small Point and Pemaquid before ever setting sail. This course gives you the essential tools to make boating more enjoyable. First, you'll learn the basics about the information found on nautical charts. Second, you'll learn about navigation aids (they’re on the charts and on the water) so you can use them to cruise safely. Third, you'll learn how to plan cruises and understand the information found on charts (e.g. buoys, lights, water depth) and to use them while cruising the area. Students will learn terms such as true and magnetic headings, variation, lines of position, chart symbols, piloting, latitude and longitude, dead reckoning, and aids to navigation and be able to use these skills to safely plan and plot a trip. The Three Rivers chart (#13293) and a copy of a chapter on navigation principles are included. A parallel ruler and dividers are needed and can be purchased separately at our Museum Store. This class meets on Tuesday & Thursday evenings starting on May 21 through May 30, 2019 from 6:00-8:00pm. Founded in 1962, Maine Maritime Museum is located on a beautiful 20-acre campus on the banks of the Kennebec River in “The City of Ships,” Bath, Maine.